The trick to teaching a bunch of kids who don’t speak English how to play a new game is a lot of hand signals and aggressive smiling. So that is exactly how we went about showing twenty-odd kids in the Dagbani speaking village of Larigbani how to play the time tested, kid approved game of “Duck, Duck, Goose”. We started out sitting in the dirt outside of the chief’s village, in as much of a circle as the four of us field representatives could make, motioning to the kids to come and sit with us. The bravest by far were the girls, who marched up with little siblings on their backs, plopped down with a burst of dust and stared at us with curiosity and the sort of humorous trepidation you’d imagine you’d feel whenever finding yourself sitting in a circle with four wildly gesturing, wide smiling salamingas who wandered into your hometown for the first time only the day before. A few more kids trickled in, and after calling over our translator/BFF Simply to help explain our foreign blabbering to the kids, we were off. The game started out slow as everyone got familiar with the in’s and out’s of Duck, Duck, Goose, but quickly ramped up. Before we knew it we had a crowd of both adults and children watching our game, yelling out encouragements to the Goose’s and hooting with laughter each time one of the kids picked a field rep as the goose (they mostly forgot the word “duck” pretty early on, so we had to judge who they were picking as the goose by how forcefully they said it. “Goose, Goose… Goose, Goose, Goose… GOOSE!”) and we had to hoist ourselves up, sliding on the loose ground as we chased the little darts around our now sizable circle. Eventually we had to call it quits to get to work, leaving our circle of brand new teeny tiny friends for the track to the dugout, but had those stubborn, cheek picking smiles stuck on our faces for the rest of the day. 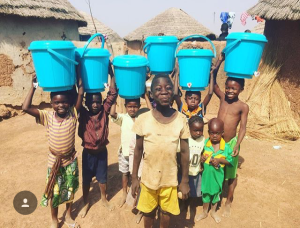 If you can believe it, we’re mid-way through the process of setting up our clean water business here in the outskirts of Tamale! Over the past two weeks, there have been far too many experiences to recount in full, but one of the most memorable of the bunch has been finally getting to know our women entrepreneurs and training them on how to set up, manage, and eventually take over the clean water business. 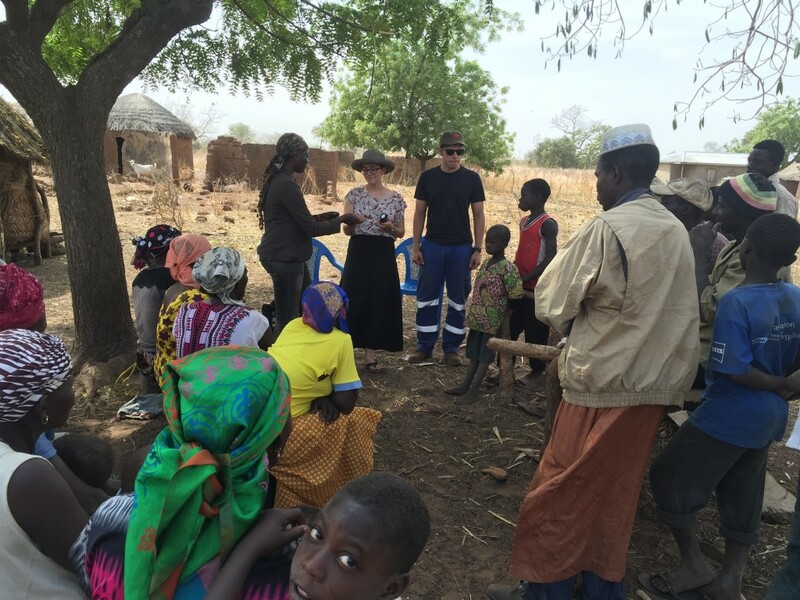 Our team works in a tiny village called Lambo, with just 10 village households and 17 Fulani households. It’s tucked away in a verdant grove, and is very much off the beaten path, leading to a scenic drive there but also lots of difficulties for our villagers when it comes to accessing basic resources. In particular, their water situation was notably worrisome when we first arrived. 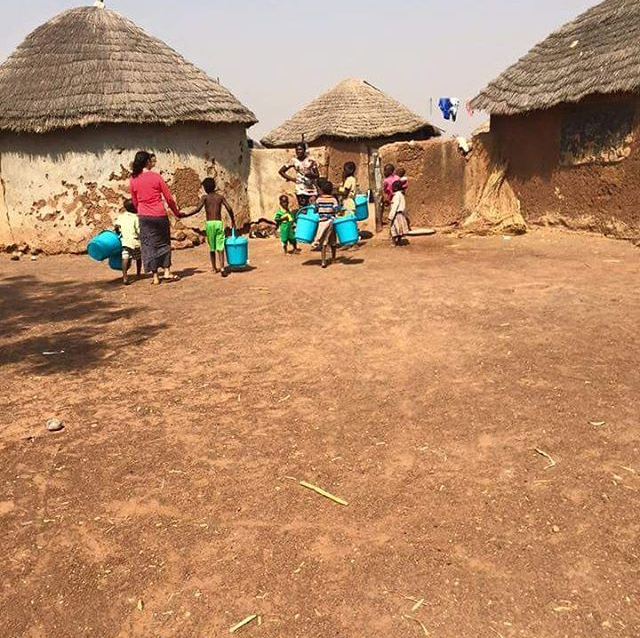 They are currently drinking out of a very shallow dugout nearby town that may dry up shortly if the rains don’t come. 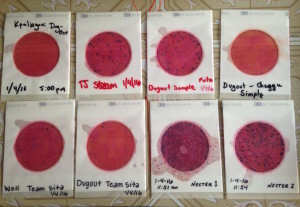 As a result, the water quality is very poor – it is heavily silted, covered with a light layer of scum, and our tests came back showing that it was full of E.coli and other dangerous bacteria. 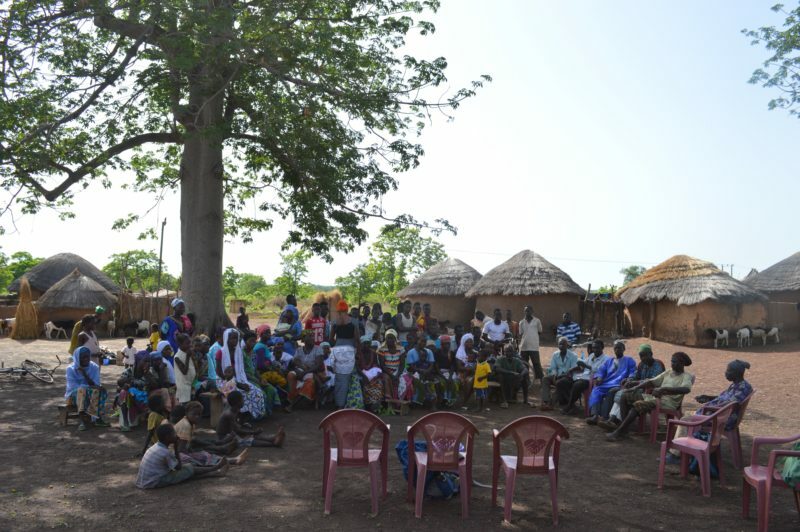 Fortunately, meeting with the chief and the community went smoothly – everyone was quite receptive to the idea and asked some great questions before welcoming us into their village to begin building the center. The two women who were nominated to run the center are named Fuseina and Awabu, and both are strong in both body and spirit, incredibly attentive, and very much committed to the well-being of their families. 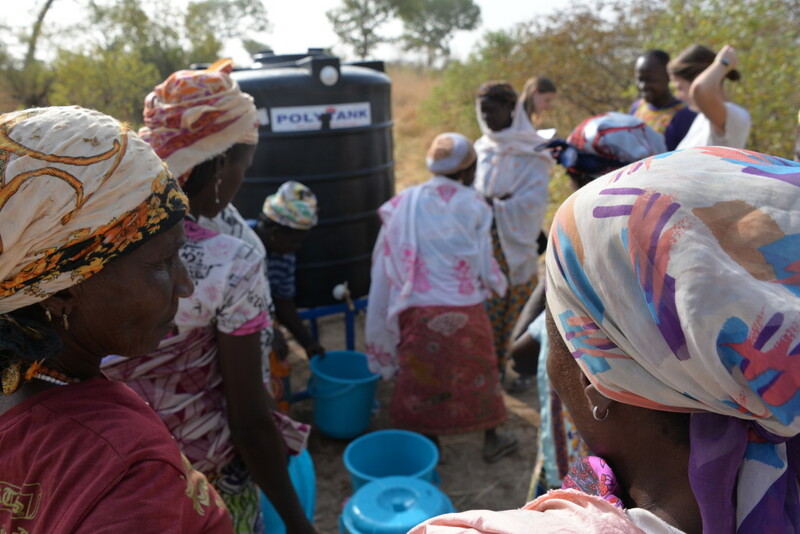 The process of training our women partners turned out to be relatively simple, as they have been dealing with household water their whole lives and intuitively understand the need for providing their families with clean water. First, they fill our three 200L jerry cans with dugout water using their garrawas, the large buckets they use to fetch water, helping one another hoist them over their heads and pour them expertly into the cans. Even with only two or three women filling the cans, we were shocked at how rapidly and efficiently they were able to move that much water around so quickly! A true feat, as anyone who has attempted to lift 50 pounds worth of water over the heads could attest. 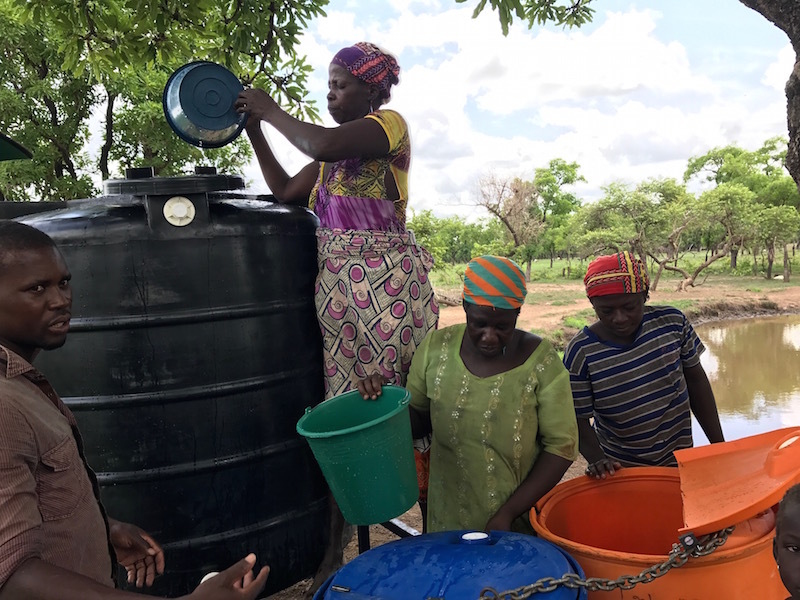 Once the jerry cans were full, we showed Fuseina and Awabu how to use alum, our flocculant of choice that helps the sediments in the water clear and settle to the bottom. 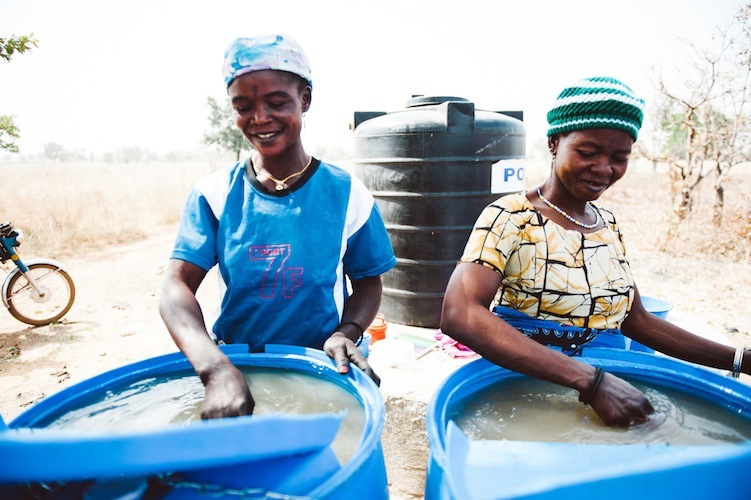 Many people in the North have used alum before in order to clear the water they use for laundry. As a result, the women took to the task instantly, rolling alum into tight balls and barely needing any guidance on how to swirl the golf ball sized chunks in the cans with care. Finding the right amount of alum to use is a bit of a tricky process – use too little, and the water doesn’t clear, but use too much and the water has a bit of a funky, chemical taste – so we urged our women to err on the side of caution. As it turned out, the first go around wasn’t quite enough, so we had to add a little bit extra the next day, but no harm done. Once the water had settled and cleared, and we’d lugged our big, 1400 litre polytalk out to the village and mounted it on the stand, the water was ready for purification! 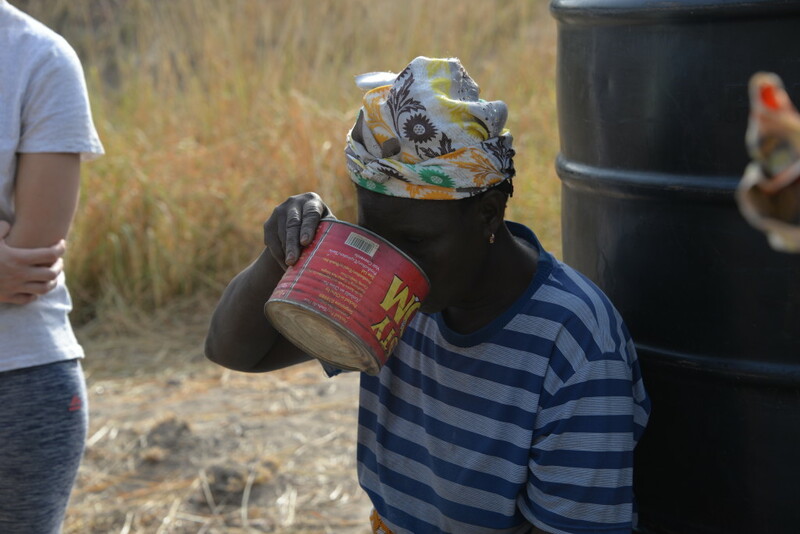 Using smaller hand buckets, Fuseina and Awabu delicately scooped the clear, sediment-free water from the top of the jerry cans and poured them into the polytank. We gave them a bag of starter chlorine tablets to use for the time being, and briefly explained to them that they only should add 1 big tablet for every jerry can of water that gets added to the polytank. The two of them listened intently, nodding and making small comments to one other, before getting right to business. Sure enough, the water came out clear and sterilized once poured from the polytank and tested, so we should be good to go for our opening day tomorrow – a huge achievement and a great testament to the hard work of our female entrepreneurs. In all, it has been a delight to get to know the women who will be at the helm of our business, and we only have the highest hopes for them and their commitment towards providing their communities with clean water. There may be some challenges and road bumps ahead – once the current dugout dries out, we’ll have to relocate the center to a different one nearby – but if the perseverance we’ve seen in our villagers thus far sticks around, they should have no problem getting the center up and running again. 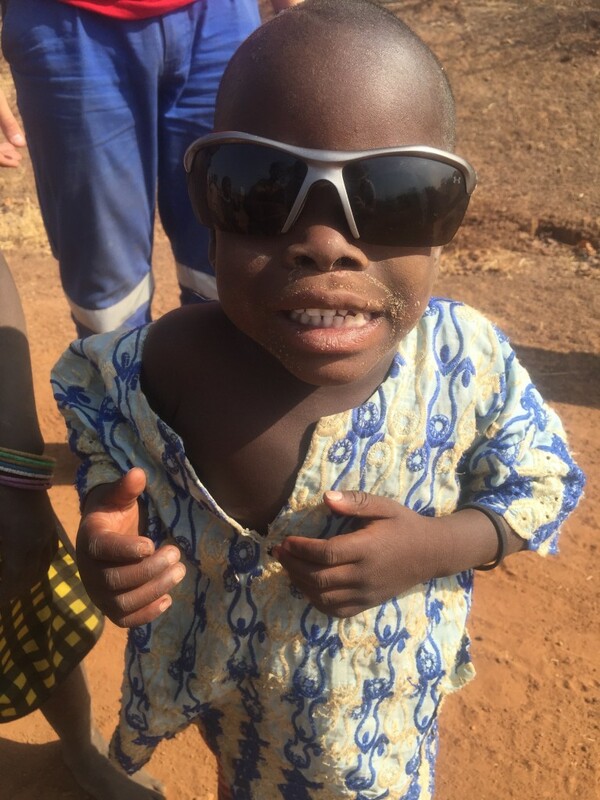 So here’s to a future of clean water for Lambo! With this post, we’re kicking off our “Field Rep Voices” segment for summer 17! What better way to keep you up to date with the progress of our 10 new water business implementations then to hear from our Field Reps themselves? Over the next few weeks, you’ll have the chance to hear from each team about the challenges and successes of all our new business. So without further ado, take it away, Team Peter! It was a hot one, with the temperature reaching nearly 100 degrees. The cab ride is always an interesting experience, with four of us (all over 5’7) melting together in the backseat – truly living up to our team name, Team Sweat, also known in Dagbani as Team Wolgu. Upon our arrival in the village, the whole community was waiting for us. Suri, a small village of only twenty households, is a beautiful and quiet community. Our community meeting was a success – our women entrepreneurs were announced and many questions were asked. We were excited to see the level of community engagement, with many of the community members answering each other’s questions. Another exciting moment was when a few community members asked if they could purchase additional safe storage containers to have as much clean drinking water in their household as possible. Our community meeting in Suri! At first, the kids were shy and hesitant to come up to us, but they’re beginning to warm up. 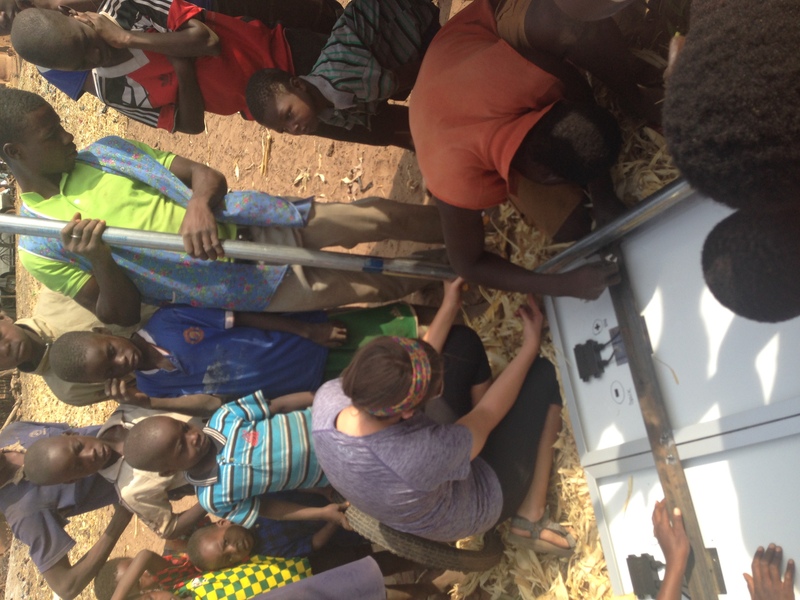 While we were painting the Polytank stand, the kids began to make their way toward us, curious as to what we were doing. 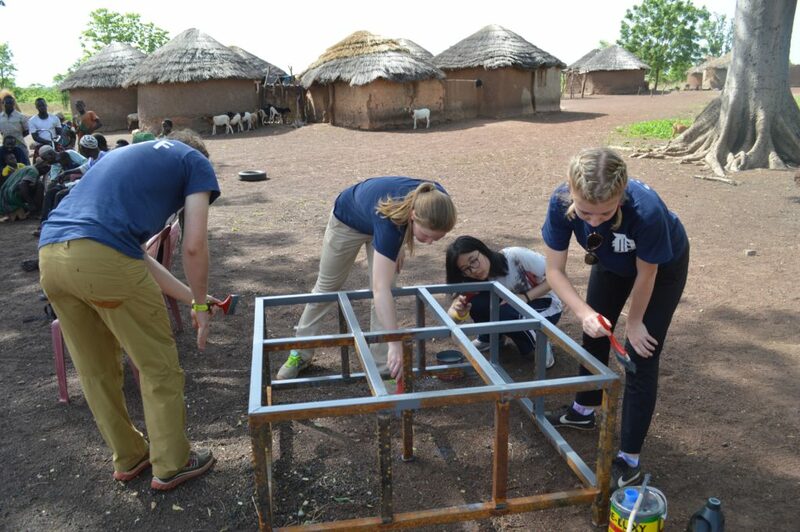 We were hoping that everyone would go back to their daily tasks after the community meeting, but instead, all eyes were on us as we meticulously painted their stand, hoping that we didn’t miss a spot. Painting the polytank stand continued! After we finished painting our stand, we took another trip to the dugout, hoping that we wouldn’t run into any of the crocodiles that we’re told dwell at the bottom. While we were visiting the dugout, we encountered a group of Fulani women for the first time. They were bathing and doing their laundry. We were struck by how distinctly they were dressed, wearing colorful clothing and many pieces of silver jewelry and beads. The Fulani are a semi-nomadic people, who follow their cattle from place to place. They’re often seen as the outsiders by the village people, although they may have lived in a place for fifteen years, making their relationships more complex than it initially appears. Suri has a large population of Fulani and we are looking forward to getting to know them and understanding the dynamic more. 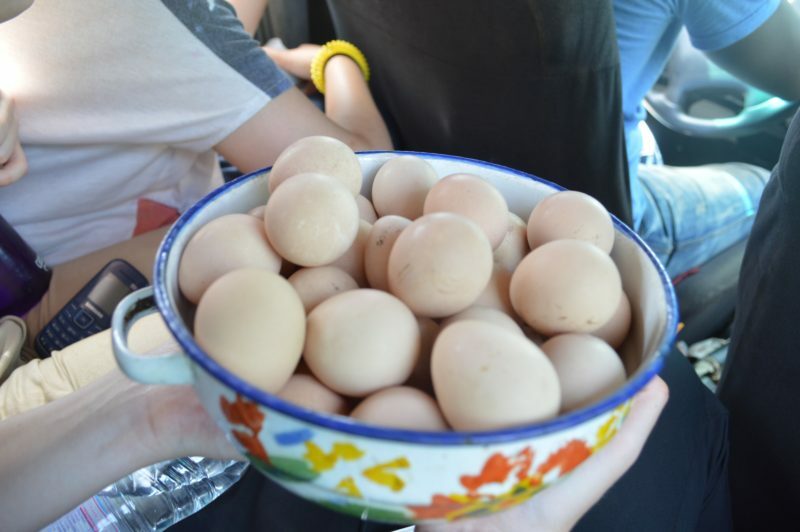 Upon our departure from the village, we were treated to a basket of eggs from the chief and a marriage proposal from the linguist, which we politely declined. Twice. We couldn’t be more excited by the response that we received from the people of Suri and we can’t wait to move forward with the water business. A gift of guinea fowl eggs from the community! It’s crazy to think that less than a week ago we were saying farewell to the 2017 Winter Field Reps. 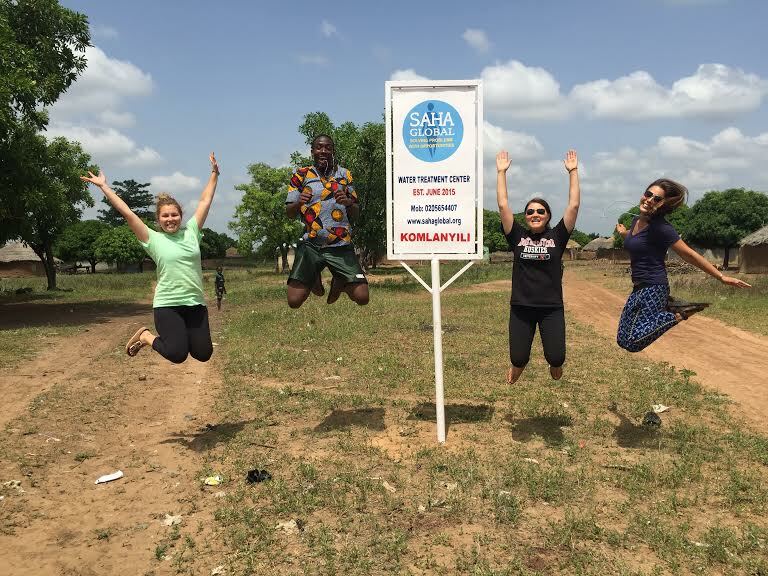 Thanks to this group of awesome, driven individuals, Saha was able to partner with with 9 communities in Northern Ghana to open 7 new water treatment businesses and 2 new solar charging businesses, which provide jobs to 21 new entrepreneurs. 1,664 people now have permanent access to safe drinking water and 752 people have access to reliable, clean solar electricity. Additionally, 5 of our water entrepreneurs have now been trained to run solar businesses, increasing their earning potential! We can’t believe that just under a week ago, we packed our bags and loaded up in front of GILLBT for the last time! 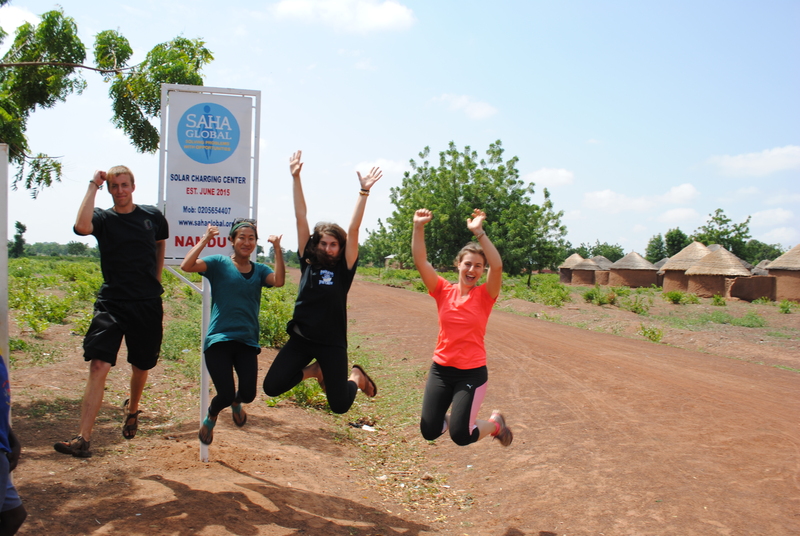 We are so grateful for the excitement, enthusiasm, hard-work and positivity that you brought to team Saha. Because of you, thousands of people are living their lives with more opportunities for health and happiness. It was such a pleasure to work with all of y’all, and we consider ourselves lucky to count you as part of Sahayili! 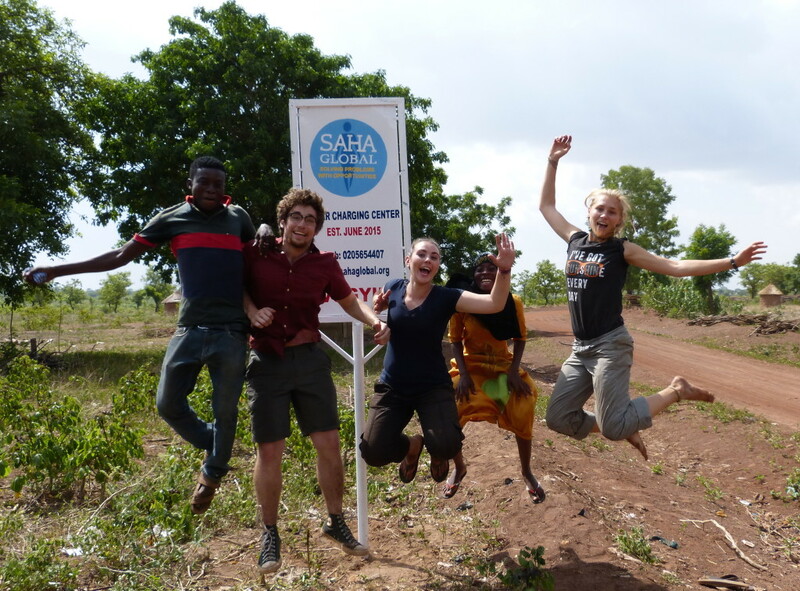 As you head off to your next impactful adventures, please don’t forget your community and all of us here at Saha, and let us know what we can do to further your missions. And now … for the jumping pics! As we were sitting on the thin wooden bench in the middle of our village, we began to reflect. We had sat on that thin, wooden bench two weeks earlier when we were asking permission from the chief elders, and community to implement a water treatment center. However, this time we were sitting on that bench to say goodbye to Kombonaayili and thank them for all of their help. There was no doubt in our minds that the past three weeks have been an adventure and some of the best we’ve ever had and with those three weeks came a lot of firsts for each of us. 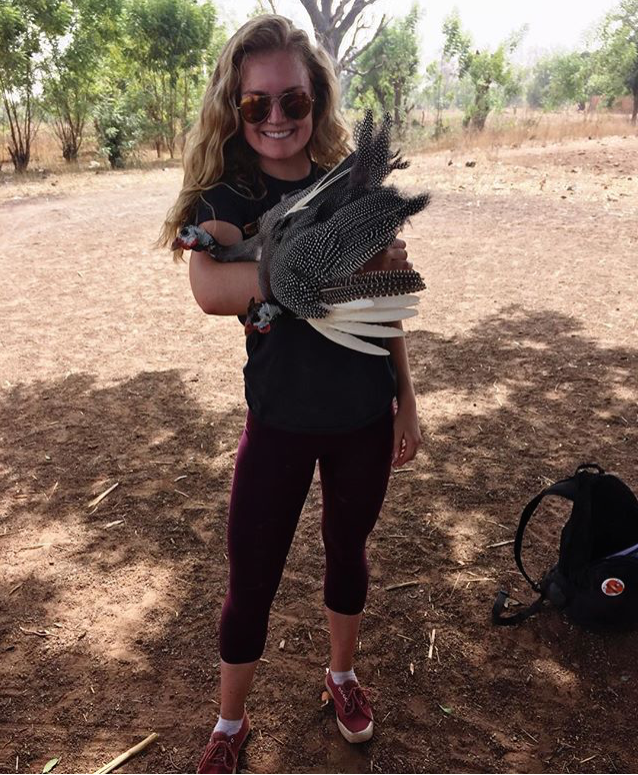 This trip was my first experience in Africa. I have never ever been across the Atlantic before- a useful fact for those Never Have I Evers. I was not sure what to expect in the “city” I would be staying in or the village I would be working in- I didn’t even know if they used bathrooms, for example, and if so, what kind. Through my weeks, the thing that struck me most were not the differences between what I felt would be a strange planet and the U.S., but the similarities. The city doesn’t have the sky scrapers I’m more familiar with, but it bustles all the same. The people I encountered loved to tell jokes and laugh with me about them. It was a way of welcoming me that surpassed any greeting. The children love to play with us, completely ignoring the fact that we are bizarre-looking strangers. After three weeks here the differences are hardly noticeable. I’ve been welcomed by so many people, both directly and indirectly, that this place has started to feel like a home away from home. I am sad to see it go- Komonaayili, Tamale, Ghana, and Africa in general. This trip was my first time using a bathroom that essentially was a separated “room” and a cement floor with a small hole in this wall to drain everything to the outside. At first it was somewhat scary, but after 2 weeks of using the restroom around 10 am every day, it became part of my daily routine. You only really get to know a village if you use their bathroom. I can honestly say that this trip was the first time I have ever made a baby cry just by looking at it. .I wish I was exaggerating. Some of the children in our village have never seen “salameenses” (It means white people, but is used to describe all light-skinned foreigners) before or even heard of one for that matter so we must seem like aliens to them. I remember walking into one household and seeing a bay about two years old screaming and running away from me. Unfortunately, he ran into the house I was about to go into so the screaming continued. While I was in the house one of the women picked up the small boy and shoved him in my face as to say “see they aren’t that scary” but it just made him scream louder and squirm until the woman let him go. For the remainder of the time he sat on another woman’s lap with a shawl over his face to keep him from seeing us and to silence his screams. This is of course just one instance out of many, but it is definitely one I’ll never forget and one that I can hopefully look back and laugh at. I never ever in my 22 years of life imagined that I would be betrothed so early. I was one of the fortunate ones that had been chosen by one of the village chiefs to be a second or even third wife (polygamy is a normal practice in Northern Ghana). This was obviously just said in jest, and no rings were ever exchanged. No, mom, there is no reason to alert the U.S. Embassy. I am indeed coming back home, promise! But it was not uncommon to hear a man ask Sean, my teammate, if he could have one of “his” women. Sean would very graciously decline and try to explain that we belonged only to ourselves. But after two days, he was practically giving us away for free. Now, this may make the villagers seem as if they treat the women as a commodity, however that was not the case. All of the women we met were powerful and outspoken. It was almost surprising to me at first. They could carry babies on their backs and a bucket of water on their heads, as they carried other items in their hand. They did not seem to hold back on their thoughts, even when there were men around. And even today, as we sat on that wooden bench, when we were trying to make sure to reiterate the importance of the women in the village and their role in the treatment center, we were received with only reassuring agreement. It was one of the top moments in that village, probably next to getting “engaged” numerous times. Overall, no matter what our firsts have been, they have only served to open our eyes, our minds, and our hearts. So if you ever decide to apply as a field rep, be prepared to have many interesting firsts! Today began with uncertainty… Last night we lay restless with the thought that our Poltyank water could be contaminated. 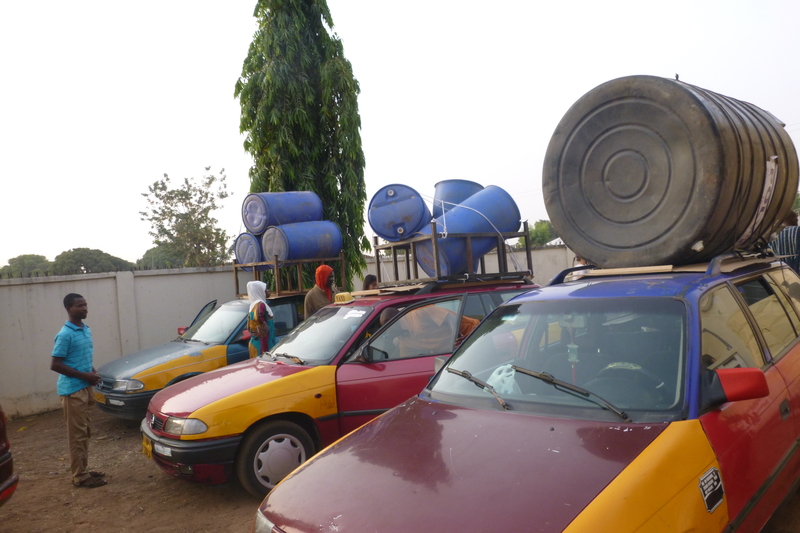 On the ride to Futa today, we anxiously waited for Kathryn’s call to disclose the water tests. To our relief, the water was clean! Although we were one man down (feel better Jess!) we were so excited that opening day had finally arrived!!! 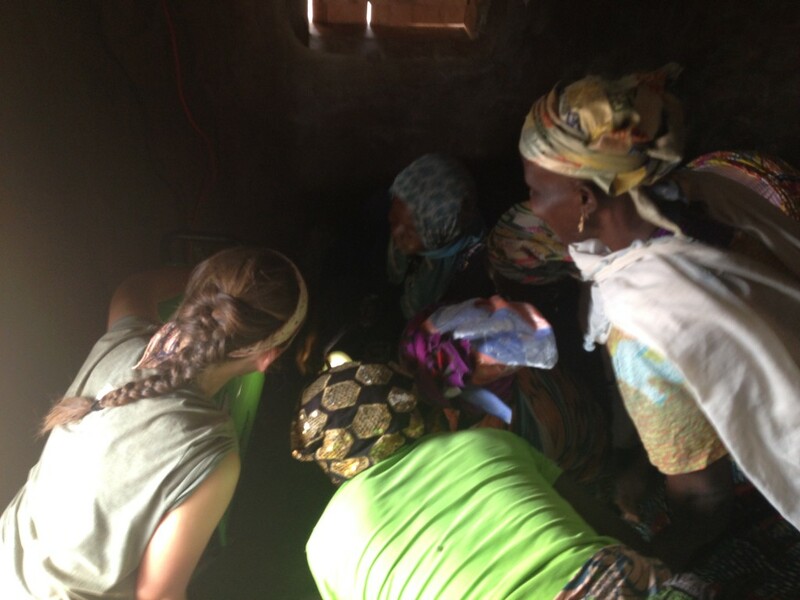 We got to Futa and quickly realized the key to the Polytank was with our fallen team mate back at the guesthouse. Yet there was a solution: our translator TJ, a rock, and a screwdriver after much effort cracked it. There was a buzz in Futa upon our arrival. Several women had sent their children ahead to queue up for the opening. Our three entrepreneurs, Fati, Mariama, and Sanatu, met us at the treatment center, ready to make their first sales. 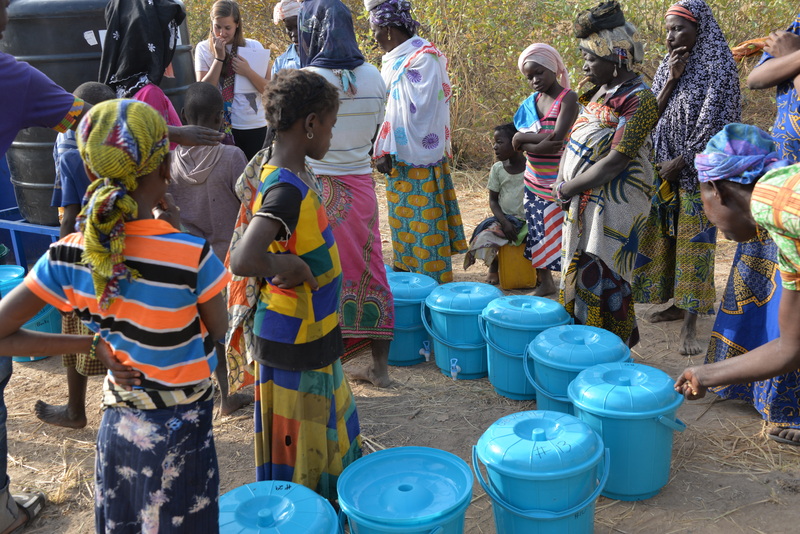 Quickly a line formed and it seemed all of Futa’s women were ready to claim their clean water with their safe storage containers in hand. We eagerly jotted down ever family that came to the center, remembering their households during the container distribution days. 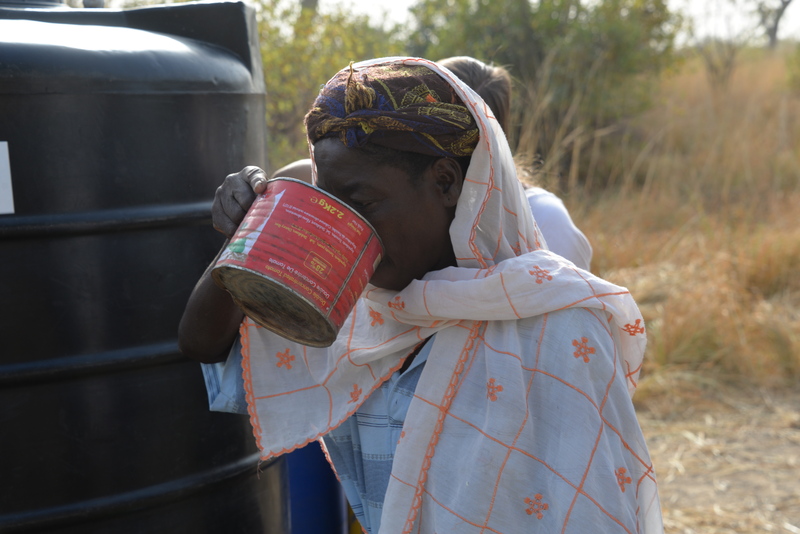 Many women tried the water firsthand and loved the taste, comparing it to sachet water locally found in town. The transformation from mucky dugout water to clear, safe drinking water was amazing. 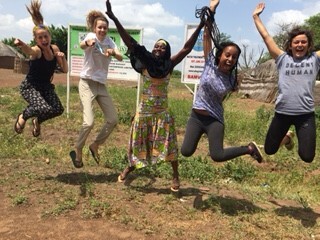 In order to celebrate the success of the center and the water’s outcome, many laughs were had and there was even a dance off between Jeremy and Fati (Fati clearly won). Out of the 32 households, 27 were present at the center. 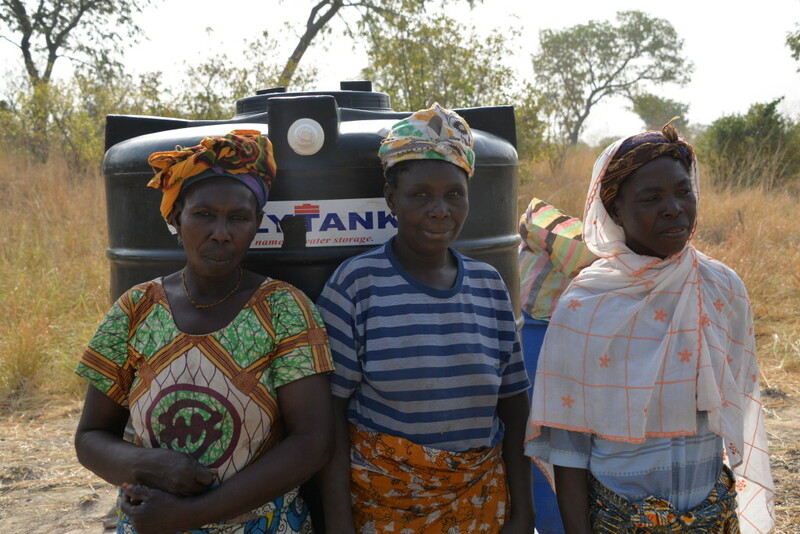 Fati, Mariama, and Sanatu did a wonderful job running their business and were beyond thrilled to be providing their community with clean drinking water. 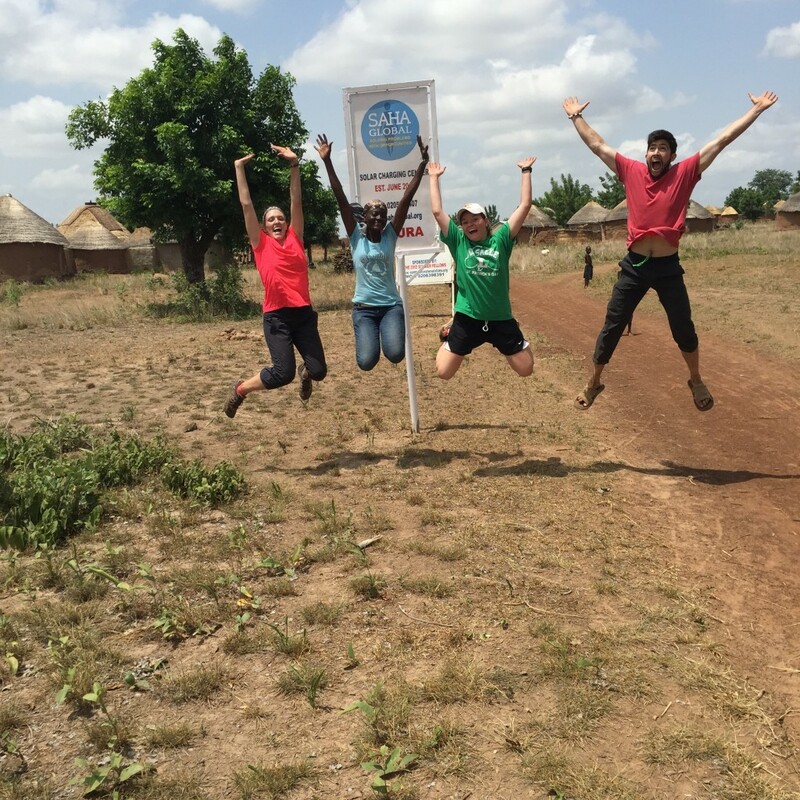 Over the course of the of the past week and a half our team has been working in the village of Vogu-Gundaa which is about an hour’s drive outside the city of Tamale. 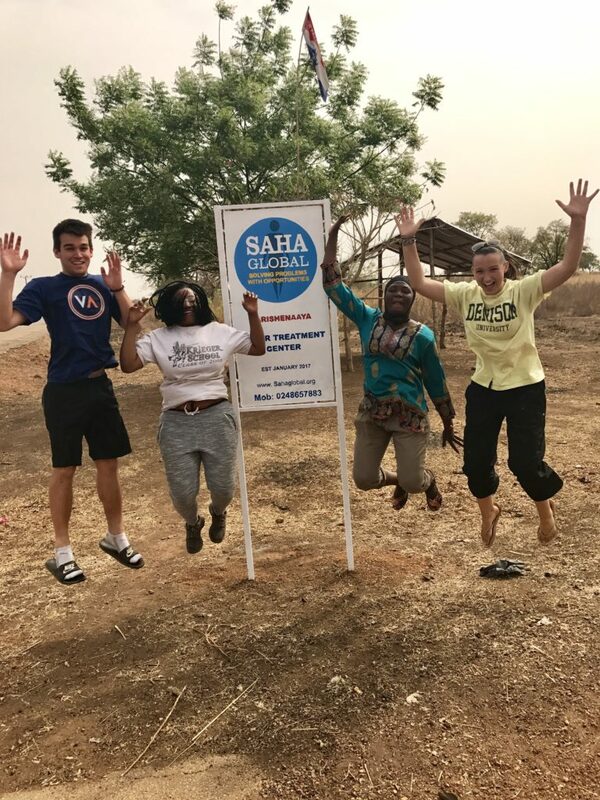 Saha Global implemented a clean water system in this community 2 ½ years ago and now we are working to install a solar center to provide the community with clean electricity. During our meetings with the chief and the community we learned that they are currently using kerosene lamps and lead acid batteries to power flashlights for lighting. They have experienced the harmful effects of these products but do not have other options to have light in their homes. 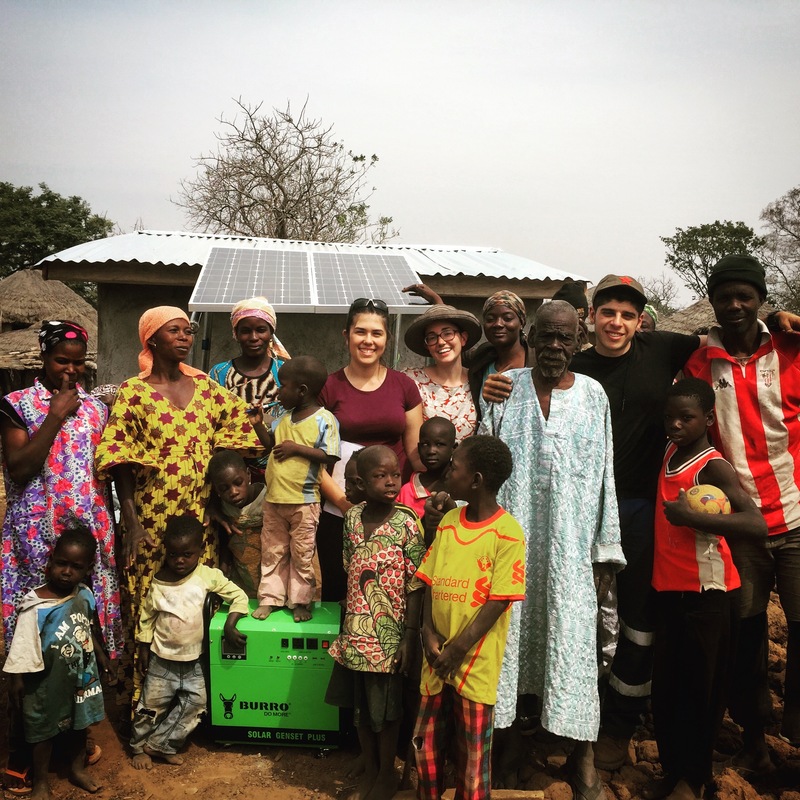 Our goal is to install a solar center that can charge reusable batteries for lanterns as well as charge cell phones and other small appliances. 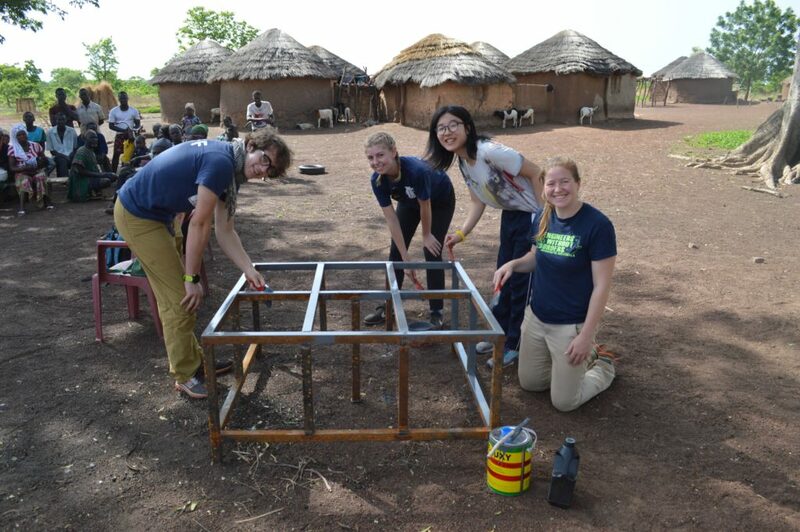 These past few days we have been working to construct the physical structure that will house the solar center. 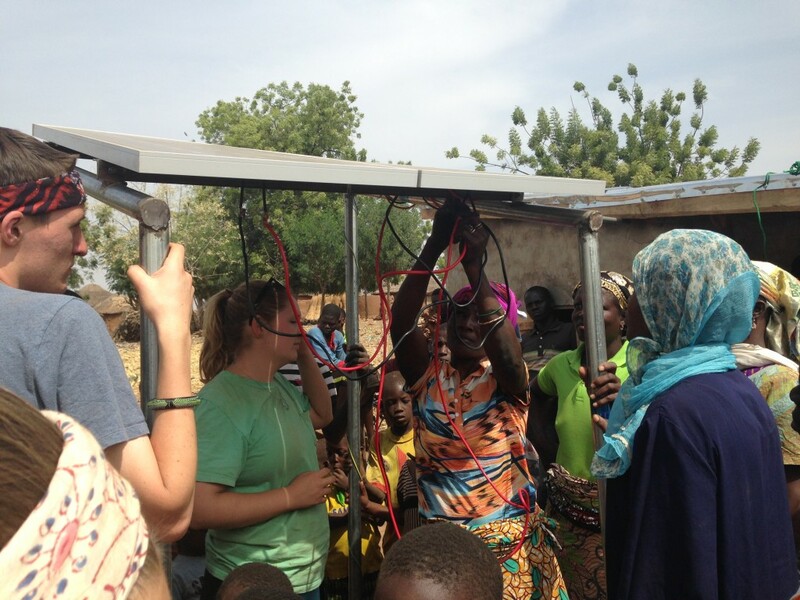 Yesterday we worked with the community to set up the solar panels. We also started to train the women who will be running the business. We are very lucky to have 4 women that currently run the water business in the village and who will also run the solar business. 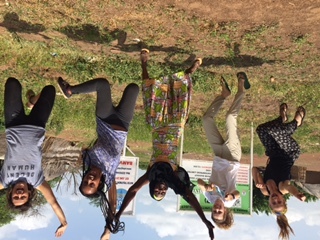 Miriam, Abebeta, Awaab, and Fati have all been very excited about learning how the system works and getting started with the solar business. The typical Saha business only has 2 women running it but we have found that with 4 women there is a lot of energy for this project and they are wonderful at working together. We are very proud of how well they are doing and excited for them to run this business! The next step of training was putting the system together. Today we disconnected everything and they put it back together independently so they knew how everything works. We have been talking them through the processes and it was so great to see their excitement when they flipped the switches and the lights came on showing that the batteries and phones were charging. This is great progress for this community and it was awesome to see how happy they are about this potential. Now that we have installed the solar system itself and begun training the women, our next steps are finishing their financial training and beginning distribution of the lanterns to the community. We have 43 households in our community and each will have the chance to purchase lanterns for a very reduced price so every household can afford it. Everyone we have talked to is very excited about the prospect of having lanterns in their households to provide light for cooking, studying and nightly chores. They are also very excited to charge their cell phones in their own community rather than traveling to town to do so. We have had a great time working with the women and the community, and are very excited to see this business prosper for the social and economic benefit of all members of Vogu-Gundaa. “Despa! Despa!” The children shouted, running after our car as we drove up. Today was our sixth day working in Sagbarigu; we finished construction of the solar charging center, held our community meeting, and installed the solar panels. 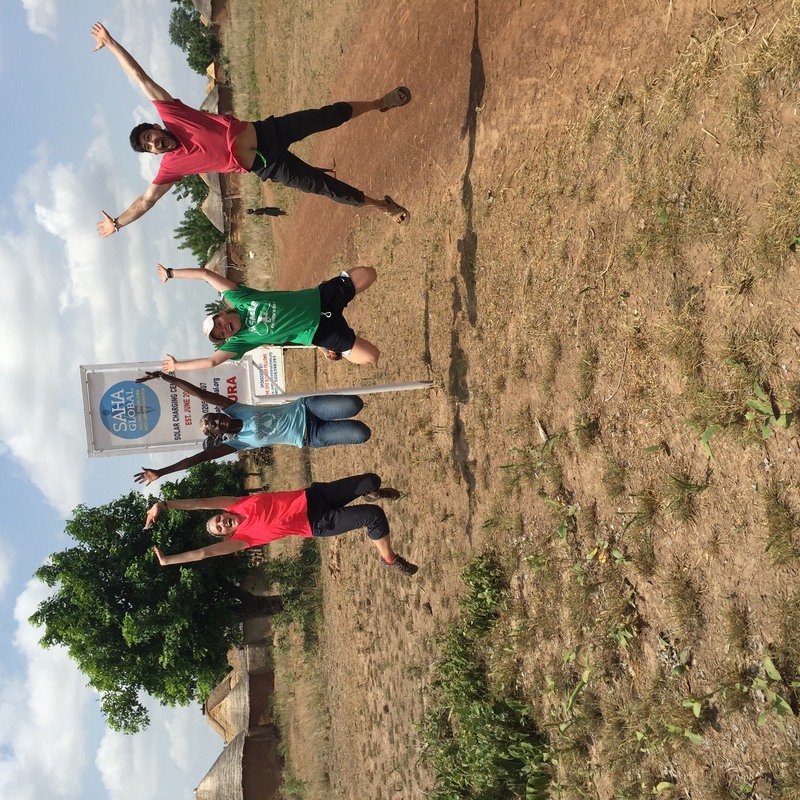 The community we’re working in is very small, located about an hour outside of Tamale. 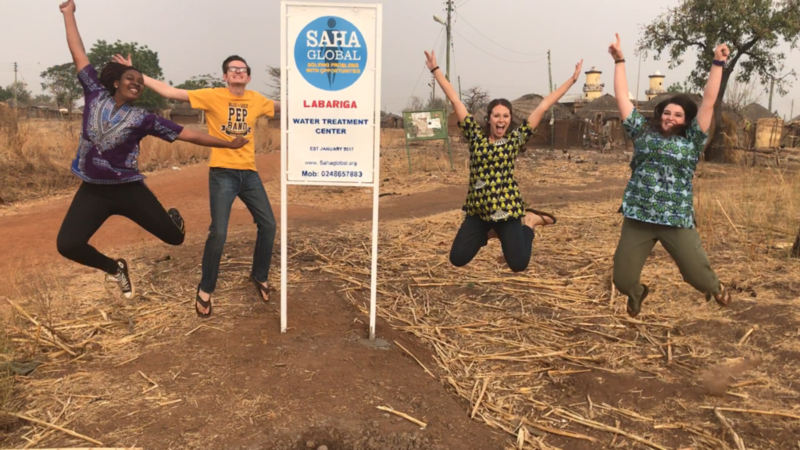 They already have a Saha water business, and the owner, Sanatu, has been taking good care of things for the past year and a half. The initial chief meeting went well, so we started building on Monday. Most of the women in the community were traveling for the first few days, so we didn’t have a chance to meet with the whole community until today. We started off by going over the details of the business model, making sure to emphasize that the entrepreneurs are the owners, not Saha Global. Then we passed around a lantern and showed them its functionality, explaining the procedure for renting batteries and charging cell phones at the center. They had mentioned getting a television yesterday, so we mentioned that the charging center is expressly not for large electronics. Near the end of the meeting, we opened the floor for questions. They asked how much everything would cost, whether they could buy extra lanterns, and when opening night would be. We told them that prices were up to the women running the business, but that they could buy extra lanterns from them later on if they needed to, and that we are scheduled to open next Wednesday! 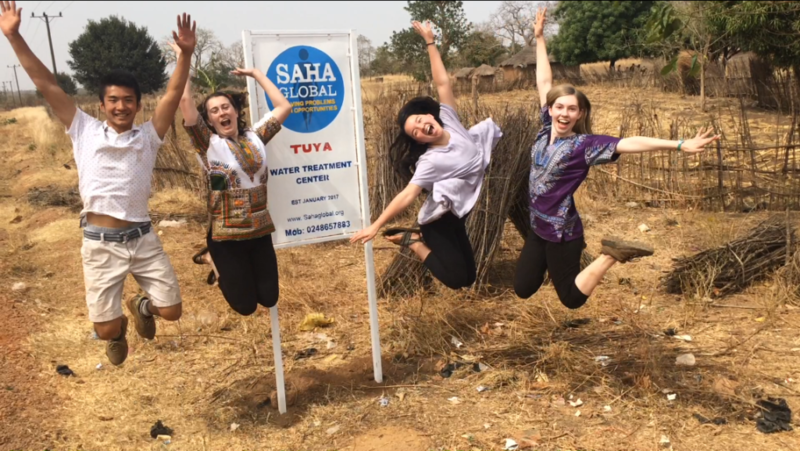 Team Nestor is having an amazing time working with Saha Global! The past couple days have been so rewarding for everyone involved in this mission to bring clean water to our village of Naha. Yesterday we had our community meeting with the village of 45 households. 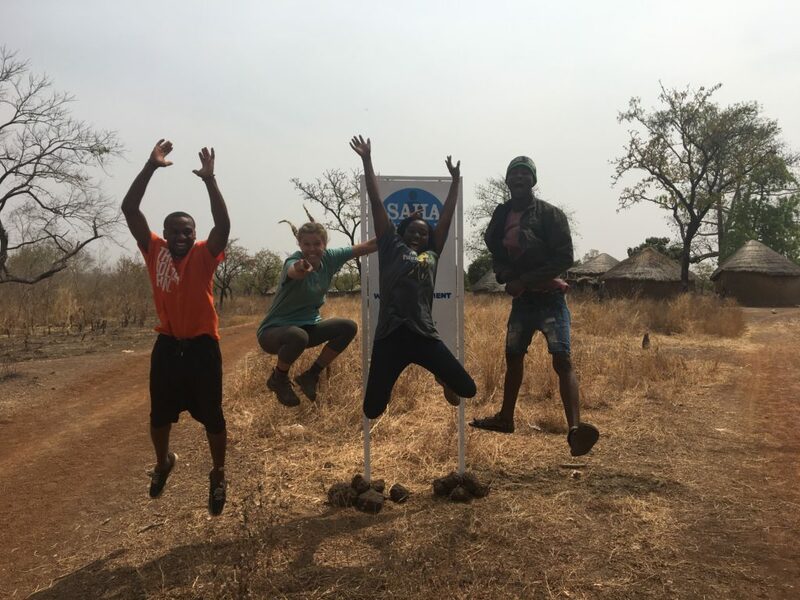 After we explained the entire Saha process, the village told us how appreciative they were for our effort to bring them safe water and we said we were so excited to begin working with them. We had our taxi loaded up with a Polytank stand and two big blue drums- a funny sight to see driving through town and down a dirt road to our village. After we unloaded our supplies, we played a game of soccer with some of the many children of Naha. It was us and Nestor vs. the kids. Needless to say, the kids were much better than us and Nestor carried the whole team. Soon after, we too Nestor out to a surprise lunch of TZ because its his favorite dish and he’s the best translator (in our opinion). 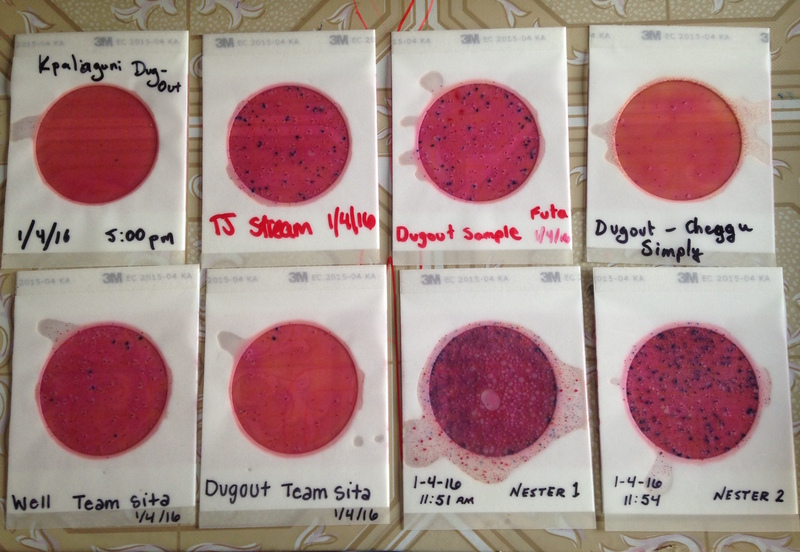 We headed back to the office to check on our lab results of the dugout water that they drink, untreated. We found some of the worst results that have been seen in a while. Our 3M test was covered in blue dots, which indicate E. Coli. It was a sad sight, but the good news is today we started training Aranhanatu and Madamu how to clean the water. We started by cleaning the inside and outside of the Polytank and 3 blue drums. The Polytank is so big that Nicole had to go inside of it to clean it. Nestor and Cayla may have rolled it around a little to scare her… it was all the kids’ idea! 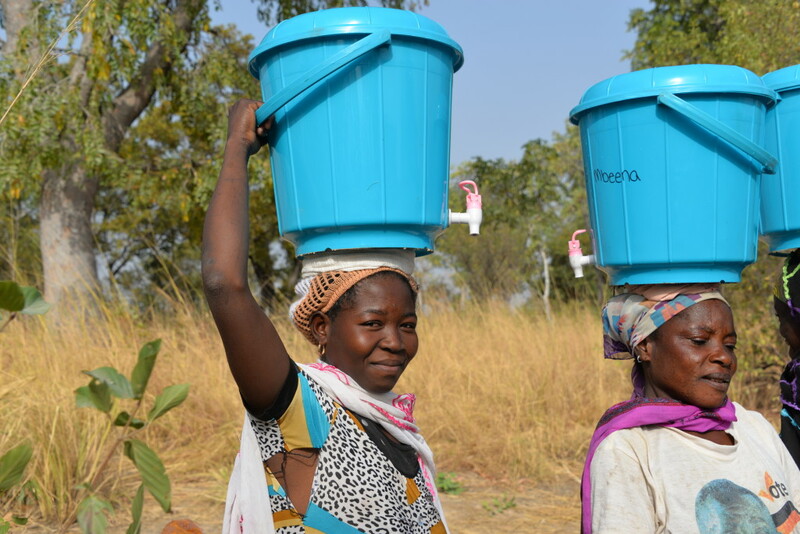 All of us helped collect water to fill the blue drums, and yes carrying things on your head is as hard as it looks. After we finished alum training, we headed back to the Saha office, blasting “Ain’t No Mountain High Enough” and teaching Nestor the words. Tomorrow, we hope to finish the training process and start distributing safe storage containers! We can’t wait for our opening day on Sunday! We can’t believe that it was just a little over a week ago that we were sitting at the top of Giddipass cheers-ing all your hard work, closing the 2015 Summer Global Leadership Program with an epic dance circle. YOU DID IT! 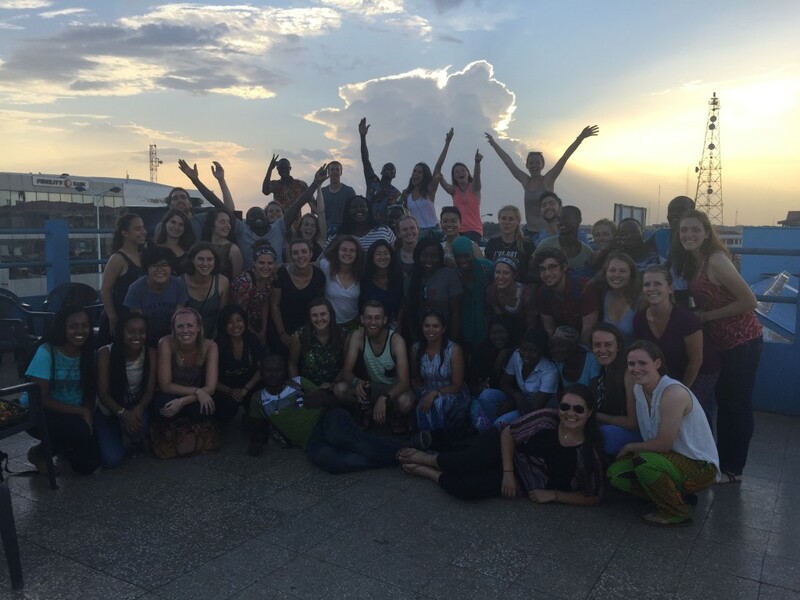 We are so grateful for your dedication to fundraise, visit doctors, and struggle with visas, sit on a 12+ plane ride followed by an 18 hour bus ride, smush into a taxi for a ~2 hour ride out to your village, work under the sweltering African heat and sun, eat the chicken and rice, jump in the cold showers, and own the layer upon layers of dirt. Working in some of the most remote villages in the Northern Region is hard work. The work to get these businesses up and running is grueling. Some days you may have asked yourself, “What the heck am I doing here?” But each day you rose to the occasion. Each day you were quickly reminded of the end goal, maybe from watching a child run to the dugout to grab a drink of extremely turbid water, talking to a mother about the effects of kerosene she has seen within her family, or chattin’ with the chief and elders about their community’s options for water or electricity. Words can hardly express our gratitude. We really enjoyed getting to know each of you. Your passion and drive are infectious. 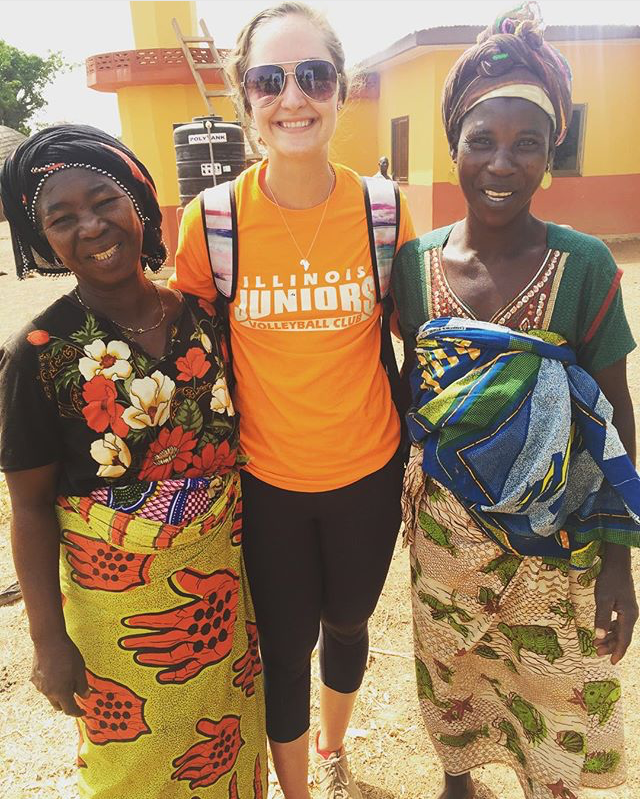 From the moment you arrived in Ghana we were impressed by your energy, go-getter spirits, and ability to learn on the fly. You all were exactly what we needed on our team to reach our goal of 11 new businesses this summer. We are so proud of the work that you were able to accomplish and feel fully confident in the sustainability of the businesses that you implemented during your time in Ghana. Thanks to each of you, approximately 1,320 people now have a permanent source of clean drinking water, 2,240 people have access to solar electricity and 28 women have become business owners. Welcome to the Saha Family! 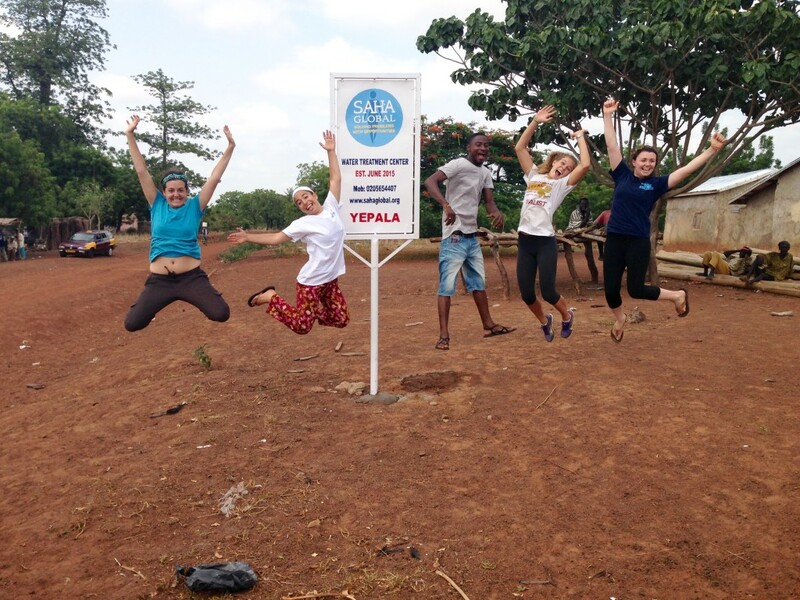 Kelly, Jessie, Wahab, Bria & Kelsey worked in Yepela to bring a source of clean drinking water to 456 people and a new job opportunity to Abiba & Amina. 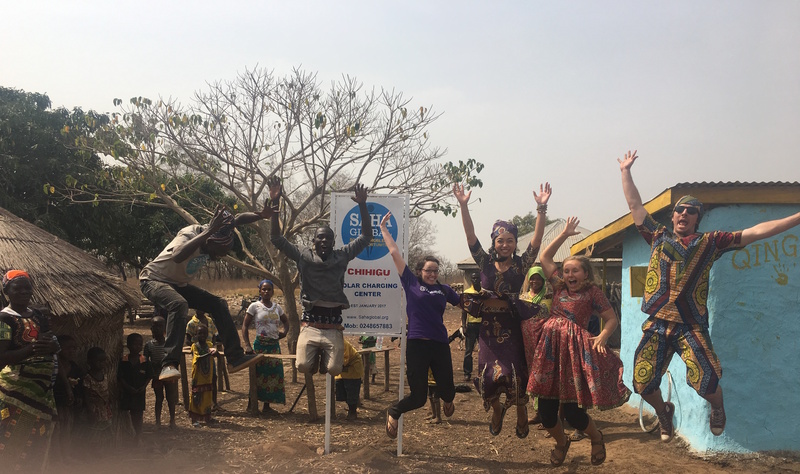 Cassie, Sharifa, Dani & Paul worked in Yakura to bring a source of electricity to 184 people and a new job opportunity to Ayi and Awabu. 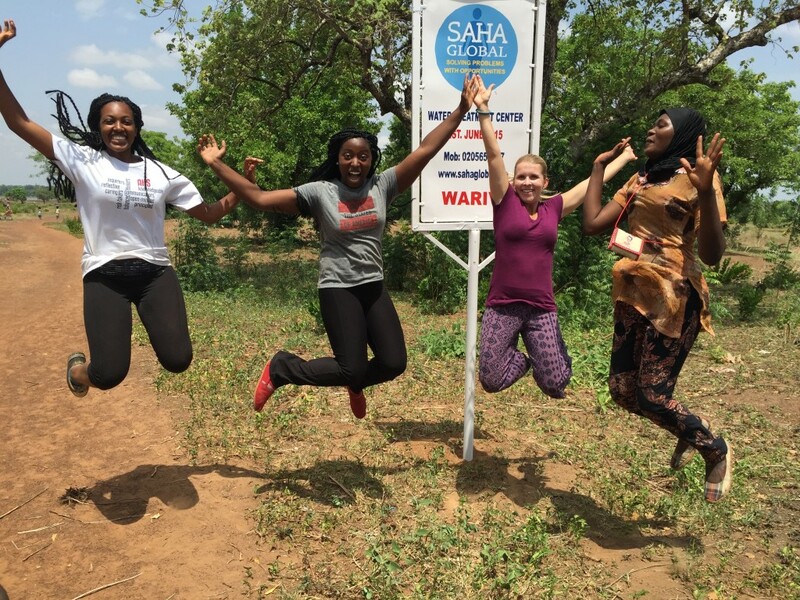 Nardos, Kristely, Dawnelle & Sita worked in Warivi brought a source of clean drinking water to 392 people and a new job opportunity to Fati, Fesina, Salamatu & Zuleha. 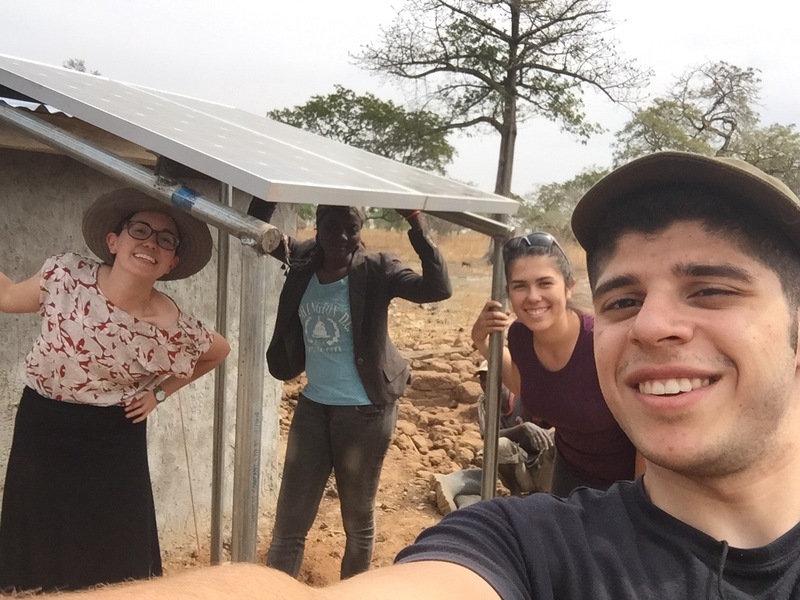 Nestor, Josh Hallie & Camille worked in Vogyili to bring a source of electricity to 264 people and a new job opportunity to Asia, Fushina & Sanatu. 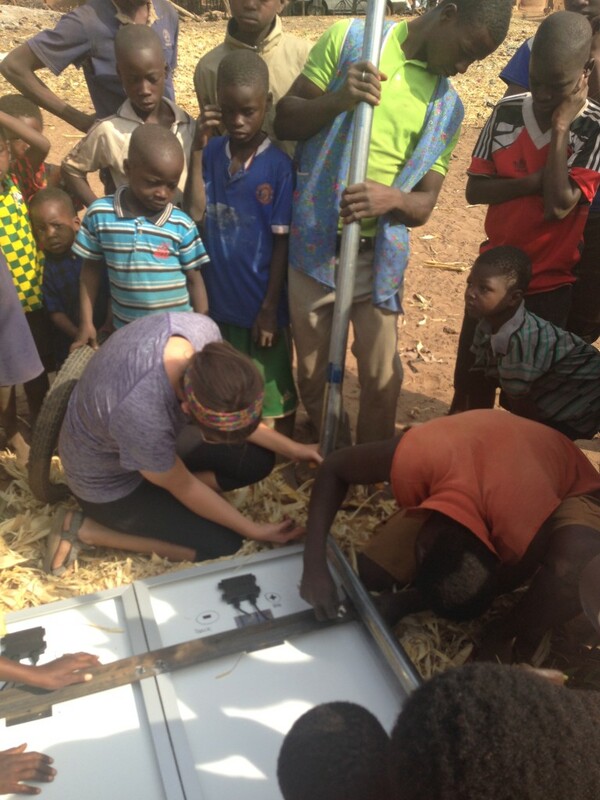 Andrew, Sol, Rachel, Val and Shak worked in Namdu 2 to bring a source of electricity to 288 people and a new job opportunity to Fusiena, Rabi and Wumbe. 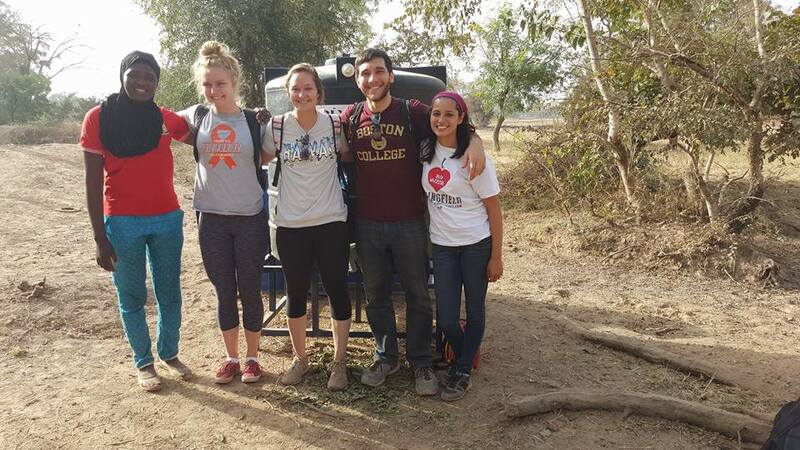 Morganne, Katie, Khadijah, Robert & Lauren worked in Namdu to bring a source of electricity to 544 people and a new job opportunity to Fatima & Sowda. 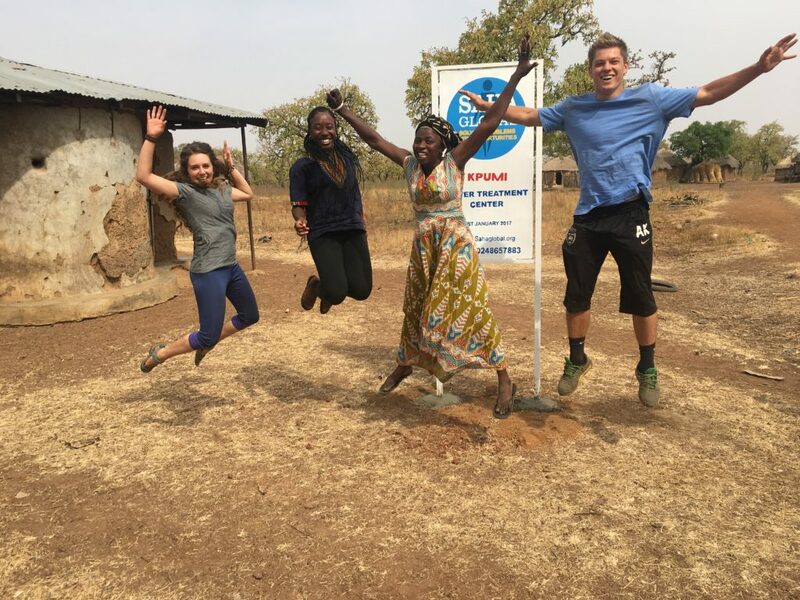 Isabel, Emma, Kevin, Eric and Molly worked in Kpenchilla to bring a source of electricity to 512 people and a new job opportunity to Zuera, Sana and Damu. 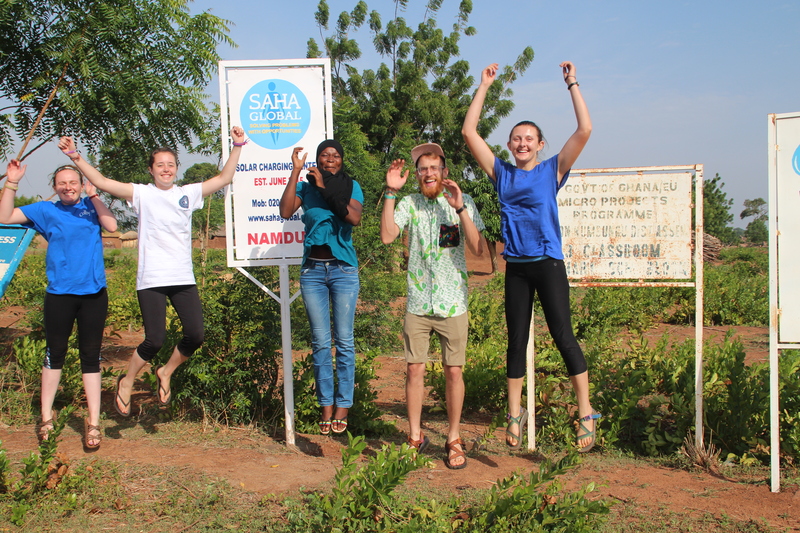 Sasha, Richard, Sarah, Tara and Amin worked in Komlanyili to bring a source of clean drinking water to 272 people and a new job opportunity to Nina & Safia. 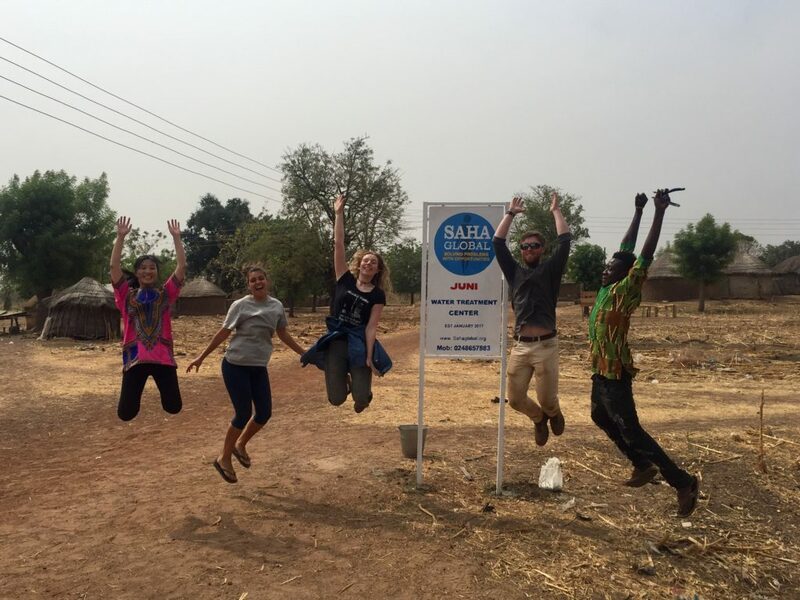 Hunter, Lindsey, Greta, Heidi & Jaleel worked in Jangbarayili to bring 176 people a source of electricity and a new job opportunity to Aisha & Salamatu. 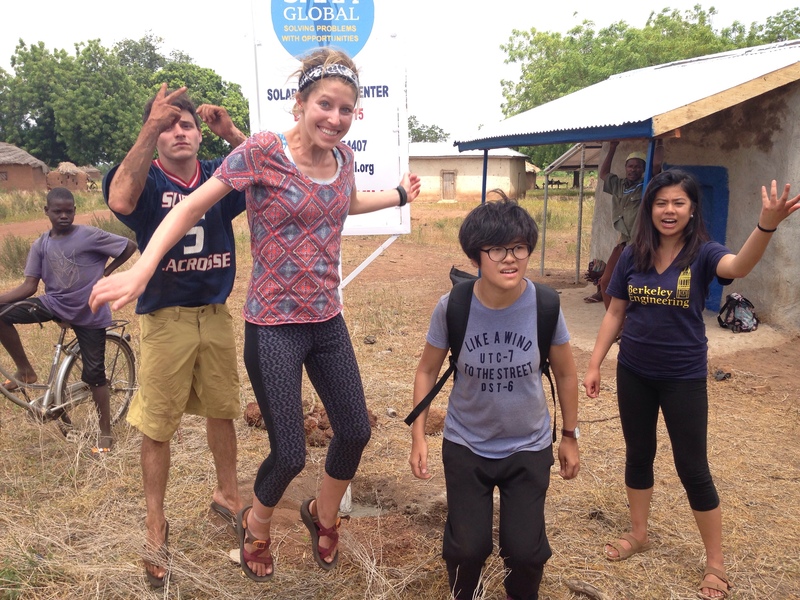 Britt, Phoebe, Mekleet, Jessica & TJ worked in Belampuso to bring a source of electricity to 272 people and a new job opportunity to Beremina, Damu and Sana. Elizabeth, Havana, Simply. 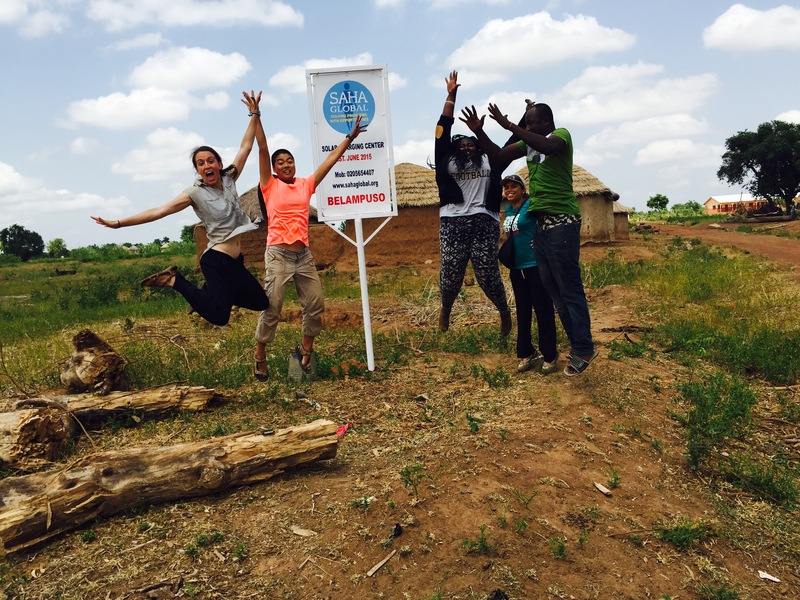 Danaite and Maggie worked in Bamvim to bring a source of clean drinking water to 200 people and a new job opportunity to Mariama and Hawabu.